Here in inland Southern California, we have to maximize on the little winter that we do get! Here are a few suggestions so you will be prepared for the winter, as well as the spring to come. The main thing we always tell people is to be sure and prune any roses and deciduous fruit trees that you have in January. This includes all rose types- bush, tree, climber, groundcover, etc. Deciduous fruit trees would be any fruit tree that drops it's leaves for the winter, such as a peach, apple, plum,pear or many others. This does not include citrus trees. This time of year is when you should do the hard pruning on these plants, and also remove any dead twigs and branches. Also be sure to clean up any plant debris around the base of the plants. This helps prevent the spread of disease. We have our pruning demonstrations coming up the first two weekends of January. You can view the event information here. 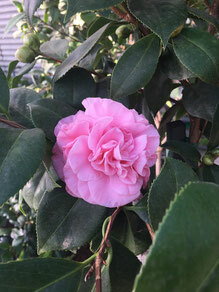 You should also prune and thin other deciduous trees and shrubs, such as crape myrtles. Any trees that have a very thick canopy should be thinned out so wind blows through the tree rather than just hitting up against it. Winter is also the season for planting bare root fruit trees. There will be another blog post on this subject soon, since there are special instructions regarding them. We will be getting our bare root fruit trees in January. Now that the spring/summer garden is getting to the end of the season, you'll want to clean up the area, pull out dead plants, and put down some organic material, such as compost, old leaves, manure, or a mixture of all of these. Go ahead and turn the soil while you're at it, just to loosen things up for the spring a bit. When you get a little closer to spring, it's a good idea to add some Bumper Crop soil amendment as well, because it will add extra nutrients, good bacteria and fungus, and will increase drainage in the area. If you have ornamental grasses that go dormant in your yard, such as Red Fountain Grass, Zebra Grass, or Deer Grass, you will want to prune them at this time. 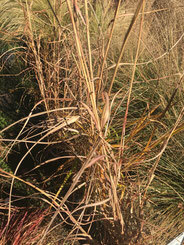 Once they turn straw colored for the winter, trim them down to under 1 ft. tall. This keeps them neat and looking good throughout the rest of the year. Lastly, don't forget to turn down or turn off irrigation systems. You may not need to run your irrigation at all throughout the cooler months, if there's enough rainfall. Even a few good storms can do the trick. Since winter is not a growing season for plants, most use a lot less water during this season. Plus, the weather's cooler, so things won't dry out as fast. Be sure to check potted plants still, as pots will dry out faster than the soil in the ground. Also remember, leaves are what use water on a plant, so plants that drop their leaves for the winter will have much lower water needs than plants that don't.